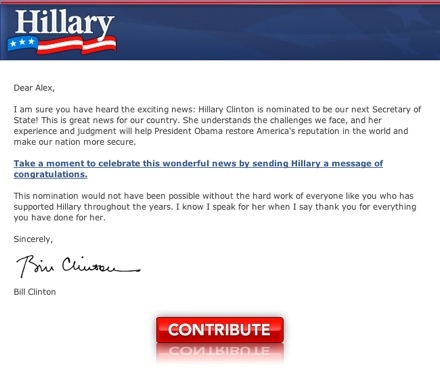 Bill Clinton sends out a fundraising e-mail congratulating his wife on her nomination to be secretary of state. Hillary Clinton may be President-elect Barack Obama's choice to be secretary of state, but that doesn't mean she has to stop raising money to pay down her presidential campaign's debt, at least not yet. On Tuesday, Clinton's campaign sent out an e-mail, under her husband's name, congratulating the senator from New York on her nomination and asking for supporters to send her "a message of congratulations" -- and some money. She's still allowed to do this kind of fundraising, but can't be involved when and if she is confirmed by the Senate.